Some things call for a loud, disagreeable dinosaur. "Jurassic Park?" Totally. "Jurassic Park: The Ride?" You betcha. But I'll tell you where we definitely don't need one: a discussion of the issues at the heart of Duncan Keith's controversial run-in with Vancouver reporter Karen Thomson. Unfortunately, Cherry really wanted to weigh in on this incident, and it probably won't come as a surprise that the man who dismissed the Metric system as "commie stuff" just last year didn't exactly have a progressive take on the issue. You can go ahead and start shaking your head in disbelief now. The hot nonsense starts at the 2:16 mark. Sigh. Not sure why Cherry stressed that he really believes this. I don't think anybody is surprised. Once more: "I don't believe -- and I really believe this -- women should be in the male dressing room," said Cherry, as Ron Maclean made the face above. 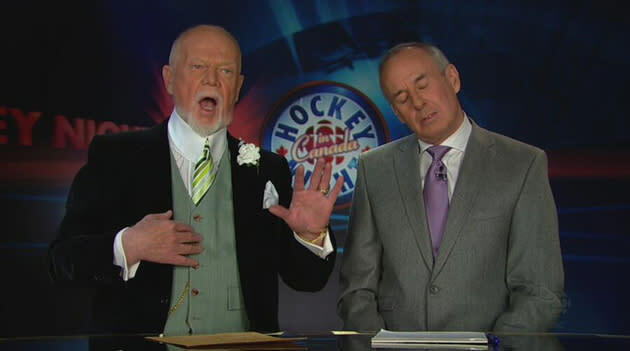 I'm embarrassed by and for Don Cherry and for CBC. Sorry. Look. This is a stupid thing for Cherry to say and an equally stupid thing for him to believe. He's so flat-out wrong it doesn't even seem worth the time to offer a rebuttal. Ask me again 20 years ago. So instead, let me just say I appreciate what he said, and not because I agree with it, because I don't. But I went on record after the Keith incident as saying I thought what he said was sexist, and many countered by telling me that Keith wasn't a sexist. But there's a difference, I think, between saying a sexist thing and, you know, being a sexist. Thanks to Don Cherry for demonstrating that difference.